Saptakanyar Kahini by Sunil Gangopadhyay Bangla Golper Boi pdf file. Dear readers, now I want to share a remarkable Bangla golper boi 'Saptakanyar Kahini'. 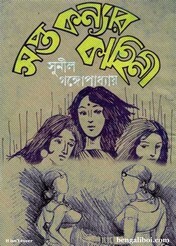 There are seven stories in this Bangla story book, these are- 'Amader Monoroma', 'Manishar Dui Premik', 'Dwitiyo Monalisa', 'Swapner Ekti Din', 'Debdut Othoba Barohater Kanakori', Amar Ekti Paper Kahini' and 'Shakuntala'. All readers can collect this seven stories collection book in a pdf file. Every story in this book are very awesome, don't miss to read this remarkable story book.